In some cases, clinicians recommend diets; in others, they’re instigated by parents eager to find anything that may help their child. But there is currently little scientific evidence the gluten-free, casein-free (GFCF) diet has beneficial effects for children with autism. The theory most commonly associated with the use of the GFCF diet relates to proposed differences in the functioning of the gut of individuals with autism. The GFCF diet is based on the theory that opioid peptides, formed from the incomplete breakdown of foods containing gluten and casein, may enter the bloodstream due to the increased intestinal permeability. From there they cross the blood–brain barrier and disrupt brain development and functioning. The assumptions here are that the gut difficulties experienced by individuals with autism are causally related to the differences in brain development. By using the GFCF diet, gut problems are reduced and autistic symptoms should improve. However, three studies have found no evidence of excessively high levels of opioid peptides in the urine of children with autism. Other studies have questioned the existence of a “leaky gut” altogether. The second problem is the results of studies that have tested the effectiveness of GFCF diets with children with autism. A 2014 systematic review found major methodological limitations of studies in this area. These included lack of a control group, poor definitions of inclusion criteria, and very small sample sizes. The studies that found a positive effect of GFCF diets on the behaviours of children with autism had the most significant flaws. Conversely, the studies that were considered to be most methodologically rigorous tended to find no benefits from the use of GFCF diets. Unfortunately, some question marks remain over the safety of GFCF diets. 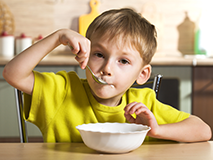 Several studies have reported that a GFCF diet is associated with reduced bone density in both children with and without autism. Currently, there is not sufficient scientific evidence that GFCF diets can be beneficial for children with ASD. Furthermore, given the uncertain safety profile, only when there is a clear intolerance or allergy to the foods that a GFCF diet eliminates would it be prudent to recommend the diet.